Adam is a Partner in the Firm’s Estate Planning and Administration Group where he advises individuals and traditional and non-traditional families on all aspects of estate planning, planned charitable giving, probate, and estate and trust administration. 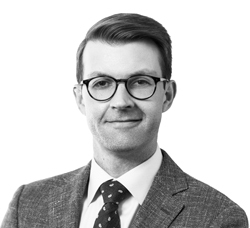 Adam has extensive experience in the preparation and administration of wills, trusts, powers of attorney and sophisticated estate planning techniques, including generation-skipping trusts, qualified personal residence trusts, life insurance trusts, and charitable lead and remainder trusts. Adam enjoys working closely with clients to create and execute plans that achieve their personal goals while minimizing taxes, maximizing benefits to beneficiaries, and preserving wealth. Adam lives in DC with his partner Josh. In his free time, Adam enjoys running, reading, traveling, and spending time in Maine where Josh is the owner and director of Camp Somerset, a residential summer camp for girls.